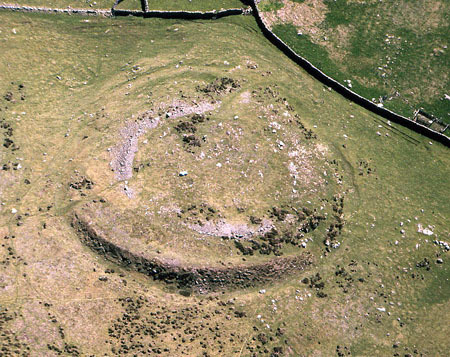 This fort is reached by car by a narrow, winding road through Henryd, from the B5106 road, south of Conwy. The road leads uphill, following signs to Llangelynin Old Church, from where a footpath leads for about 1km up the hill and over a pass. The fort lies close to the west side of the footpath. This is a small fort of only 38m internal diameter (0.1ha).It lies on the flank of a hill on a slight projecting spur and so is not in a naturally strong position for defence. However, it has strong constructed defences of a massive internal wall 5-6m in width and an outer defence of a large bank and ditch. This outer bank is unusual in that had a stone outer facing, some of which can still be seen on the west side. Little remains of the inner wall and the lack of tumbled stone has been suggested to show that it was unfinished or had been robbed to create the outer rampart in a second phase of use. The entrance to the fort was simple, slightly out-turned gap on the east side. Within the fort the only evidence of settlement is one possible roundhouse adjoining the inner rampart wall at the west side. This fort is unusual for its small size, setting and sub-circular outline. Most forts are larger, in naturally defensive positions and have plans dictated by the contours of the hills on which they were built. The position of the fort gives it wide views over the Conwy Valley and it seems likely to be specifically related to an ancient trackway, taken by the modern footpath, which leads from the mouth of the Conwy River towards the route through the hills at Bwlch y Ddeufaen to the south-west. There have been no excavations and no chance finds from the fort to indicate a date for the fort but a post-Roman, rather than Iron Age date is a possibility. Certainly, the site was re-used in the Medieval period, as a long hut was built in the shelter of the ditch and cutting into the outer rampart at the south side. 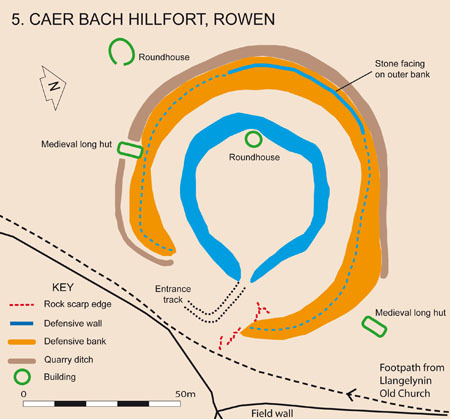 The fort and area around it are protected as a Scheduled Ancient Monument in the care of Cadw. Any kind of damage, digging or metal detecting is prohibited. The fort lies within the Snowdonia National Park. Please report any problems or damage.